“A partnership made in heaven”. That’s how Loretta Robinson-Thomas of Platinum Bride Couture and Jim Whitehead of The Nassau Florist describe their latest joint venture. A first for fashion, Parliament Street and the Caribbean Region, as they prepare to show international designer, Ian Stuart’s, collection “Frill Me”, which will close Parliament Street for this event on June 21st. This exciting event will benefit the AIDS Foundation and Lady Camille Barnett will be in attendance as the Patroness of “Frill Me”. 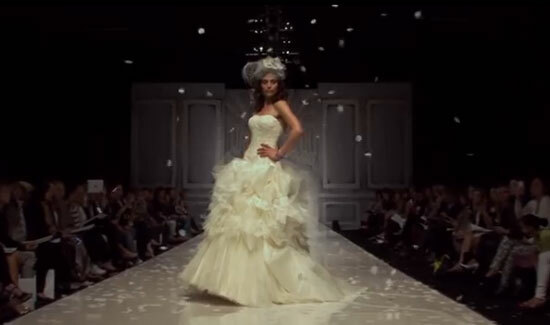 “Heavenly” best describes this collection and two of Ian Stuart’s 26 outstanding dresses to be shown are already in the Platinum Bride Couture salon. The Bahamas exclusive premiere of the “Frill Me” collection is taking place simultaneously with showings in London, New York and major cities throughout Europe. 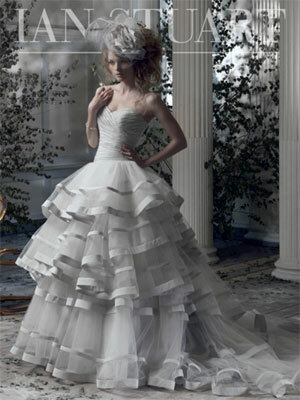 It also marks the 10th anniversary of Ian Stuart’s Fashion House, “The Collection Designed by Ian Stuart Limited” and the June opening of his new flagship store in Knightsbridge , close to Buckingham Palace. Currently he has two gowns displayed with other iconic gowns, next to that of the Duchess of Cornwall, in The Royal Victoria and Albert Museum in London. Ian is an award winning designer, well known internationally, in the U.K., Europe and the U.S.A. After graduating, he worked at Belleville Sassoon, one of London’s finest couture houses specialising in creating gowns for socialites and members of the Royal Family. Subsequently he moved on to design bi-annual collections for leading bridal and evening wear manufacturers in London before making a career move to New York where he created bridal wear labels sold throughout the world. 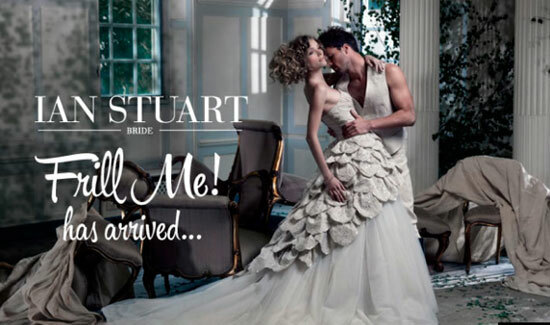 The next step, naturally, was to launch his own bridal wear brand fashion house based in London and “The Collection Designed by Ian Stuart Ltd.” was an instant success attracting world-wide publicity and subsequently earning him several industry awards. He says that launching his own brand has allowed him to focus on creating collections which reflect his passion for innovative bridal designs. This is immediately obvious when one sees the gowns. He has succeeded in providing every woman’s dream frock no matter what their taste or style, from traditional to modern to daring, they are all exquisite. In fact, many of them could be worn to any glamorous evening event and not just wedding occasions. Innovative and creative as he is, not surprisingly, many of his designs are day dresses and glamorous suits perfect for the ladies of Parliament, female executives and those important meetings or engagements. His Production Manager is flying in to produce this important show with Loretta Robinson-Thomas and Jim Whitehead. The gowns are on their way as is the music and make-up for the models. Nothing is left to chance to ensure brand recognition. A limited number of tickets are available at Platinum Bride Couture, Parliament Street, $75 each. Telephone 242 356 5080 and at The Nassau Florist Dowdeswell Street, telephone 242 302 6121. This is something no-one will want to miss – a beautiful evening and champagne reception in a transformed Parliament Street, in the heart of historic Nassau. A rare opportunity to see our own Bahamian models wearing Ian Stuart’s gorgeous gowns as part of his international celebration. Glamour and sizzle return to downtown Nassau.